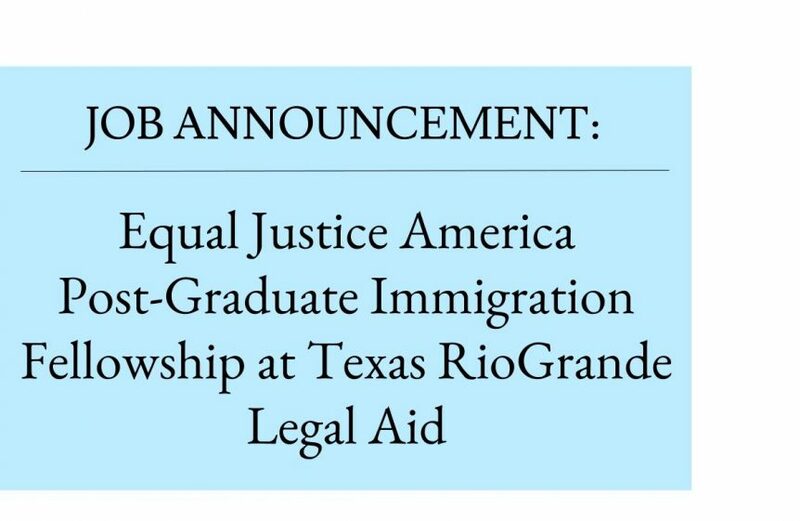 The Dilley Pro Bono Project, a collaboration of the American Immigration Council, American Immigration Lawyers Association, CLINIC and Texas RioGrande Legal Aid, is pleased to announce a post-graduate fellowship for graduating or recently graduated Columbia Law School students in partnership with Equal Justice America. Since 1993, Equal Justice America has provided opportunities for law students and lawyers to work with legal aid programs across the country. 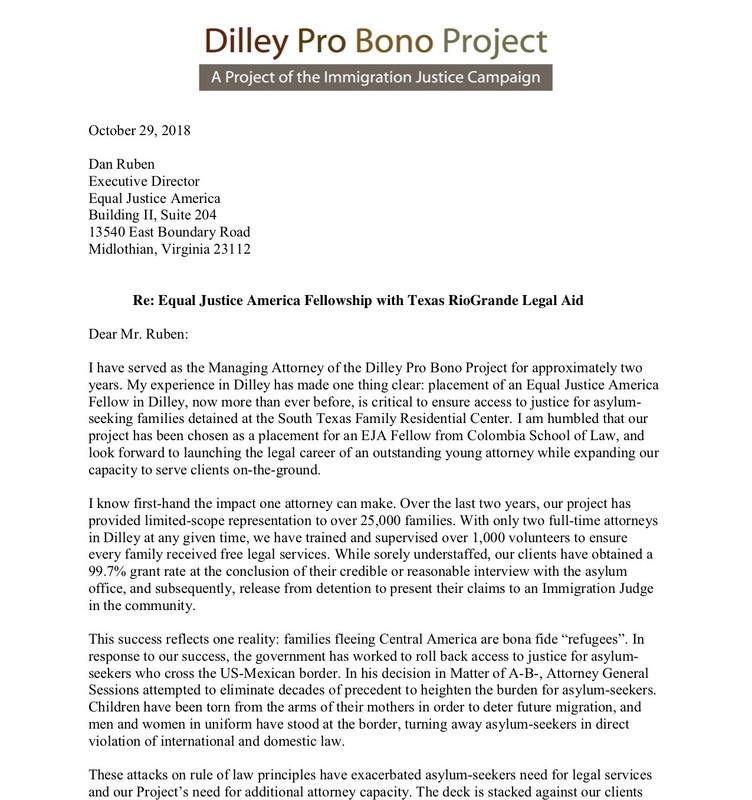 The Dilley Pro Bono Project provides free legal services to asylum-seeking mothers and their children who are detained at the South Texas Family Residential Center (“STFRC”) in Dilley, Texas. The Dilley Project’s on-the-ground team of lawyers, legal assistants, and weekly volunteers work to ensure every family receives access to counsel and critical legal information while detained. The Project simultaneously monitors, documents, and sheds light upon ongoing civil and human rights violations that occur at STFRC. • Providing direct representation before the Executive Office of Immigration Review in removal proceedings, custody/bond proceedings, and negative credible and reasonable fear review hearings. The fellow will also provide quarterly reports to Equal Justice America and share their fellowship experience with the Dilley Pro Bono Project with the Equal Justice America community through frequent blog articles and other means. The fellow will receive a competitive salary equal to a first-year attorney at Texas RioGrande Legal Aid, plus a generous benefits package. • Applicants must graduate with a J.D. degree from Colombia School of Law in May 2019, or must have graduated from Colombia School of Law May 2018 or later. • Applicants must be admitted or have an application for admission pending in any state. Bar admission to the State of Texas is strongly preferred. • Applicants must be bilingual in English and Spanish (speaking, oral comprehension, reading and writing). • Previous experience working in immigration law, with refugee populations, children and/or asylum-seekers is highly preferred. Applications must include a resume, three references, and a detailed cover letter describing how you would contribute to the Dilley Project’s work and your desired start/end dates. 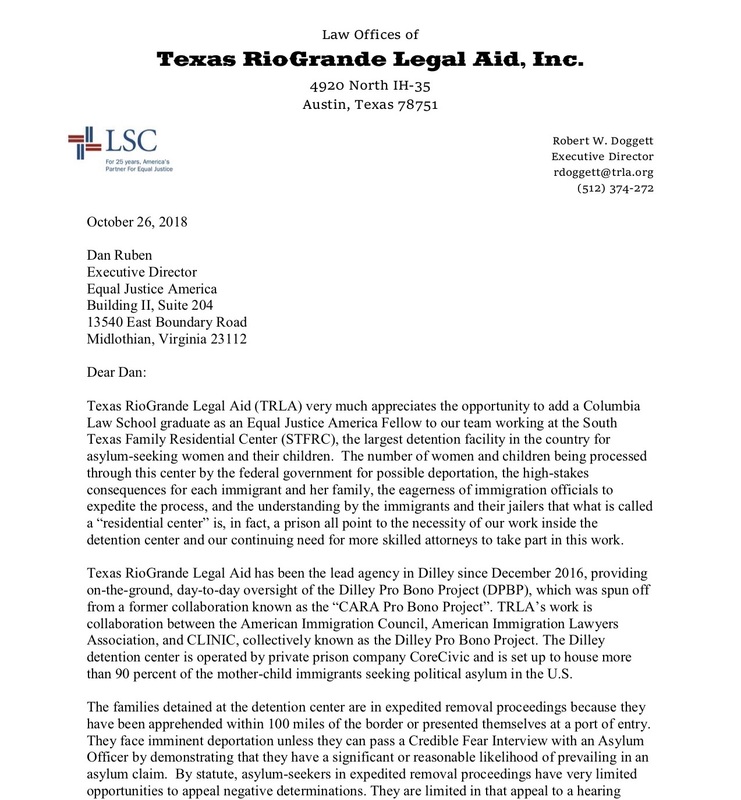 Application may be submitted electronically to Robert Doggett, Executive Director, at Texas RioGrande Legal Aid. 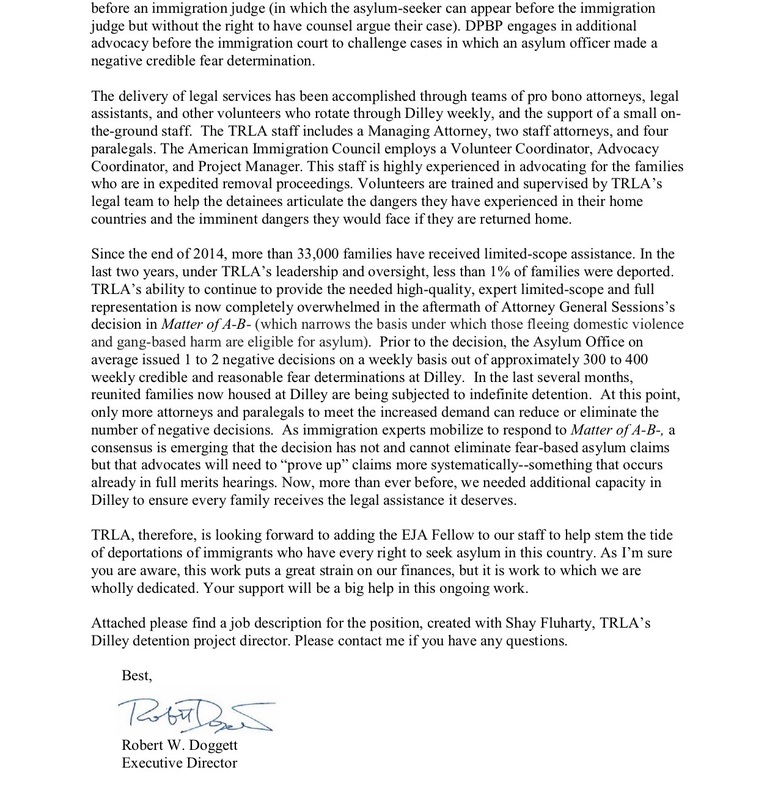 Please use “EJA-Dilley Fellowship” as the email subject line, and cc Shalyn Fluharty, Managing Attorney at the Dilley Pro Bono Project at shay@caraprobono.org. Applicants are also encouraged to fill out an Attorney Application Form. The deadline to apply is Sunday, March 31, 2019.